The whole reason for our 24 hour trip to Chicago was to eat at Alinea. We've been hearing about and reading about Chef Grant Achatz and Alinea for a couple of years now, but we never have any reason to be in Chicago so we decided to make a weekend trip out of it. 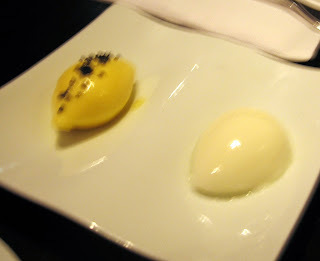 Alinea was all it's cracked up to be and more. The place is beautifully modern, serene and warm all at the same time. When you walk in the big, black door you are funneled into a long hallway that gets smaller as you progress. It sort of feels like you are entering a very modern fun house. At the end of the fun-house hallway, motion sensitive doors open into the restaurant. Before you is a fairly massive glass staircase which you follow up to the main seating area. Once there, the muted walls are peppered with simple, brush-stroke. The dark tables are lacking tablecloths, but don't seems stark and behind a long black velvet banquette in the dining room in which we were sitting was a beautiful lighting/art piece with large tubular opaque glass lights and large tubular vases filled with some sort of produce that looked like small or orange tomatillos and branches. Once food hits your table you are in awe of the specifically designed serving pieces and utensils, made by a local artist for the specific dishes. The service was pretty close to impeccable, although they are using the team-of-waiters approach that Alexis isn't particularly fond of. All of the waitstaff that we spoke to were very knowledgable about the food and were very nice, yet not at all intrusive. The only 2 flaws, and we're really searching here. 1) Alexis asked for a piece of paper and never got it. Although, to their credit, she did whip out her own piece of paper to take notes on right after she asked for one. 2) We asked the sommeiller to suggest some reasonably priced wines. That means cheap, without wanting to say cheap. However the sommeiller kept suggesting wines in the $100 range despite the fact that the wine list contained a good selection of wines in the $35-$65 range. The food was amazing, as we hoped it would be. 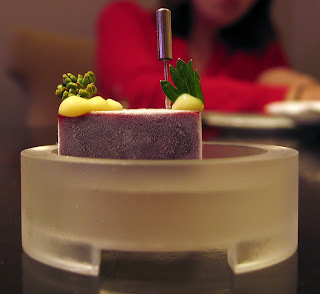 Although there were many interesting molecular gastronomy style techniques used, the food rarely felt gimmicky. There were plenty of flavor combinations we'd never thought of, but which were totally delicious. 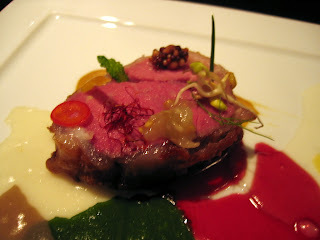 The food was refined and sophisticated, while playful and whimsical at times. 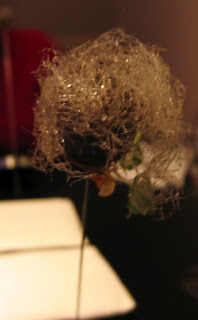 There are 2 options at Alinea, the 12 course tasting menu and the 24 course "tour". Since we flew out to Chicago specifically for this meal, we did the tour. Although 24 courses seems like a lot, many were a single bite and the meal was spread out over 4 hours. We really enjoyed almost all of the savory courses, although we weren't too into the desserts. However, that says nothing about the food, we just aren't really into sweets. One of the things we found quite incredible is that a lot of the dishes, even if only a single bite, contained many, many ingredients, yet nothing was overpowering and all of the ingredients felt necessary. The only thing we found a bit lacking was the temperature of some of the dishes. Because the bites were so small, by the time some of the dishes were in front of us, they were on the cooler side of warm. The "tour" was $195 per person, and well worth the incredible experience and delicious food. We were asked by the staff to refrain from using the flashes on our cameras so we had to work hard for these pictures in the low-light environment of the restaurant. The pictures, for the most part, are ok, but keep in mind we were working under difficult lighting conditions. This was made by shoving a lime in some clear rubber tubing and then using a blow-torch to shape the tubing around the lime. Playful and fun. On the fork is Thai poached duck tenderloin with lemon pudding and red Thai chili and a bunch of other ingredients we didn't get down. It was followed with a few sips of butternut squash soup. As a first bite, this dish really opened up in your mouth once chewed. 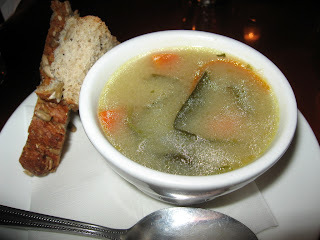 The soup was very smooth and thick and quite tasty. Giao found it a tad sweet for his tastes. This little roll of fish was steamed in lime zest and served with black and white sesame pudding, Japanese barley, tamari macerated watermelon, crispy trout skin, combu and corinader pickled watermelon skin. The dipping sauce was sesame oil and a puree of something we can no longer remember. The flavors in this dish were wonderful, although we found it a bit difficult to get all of the ingredients into a single bite. 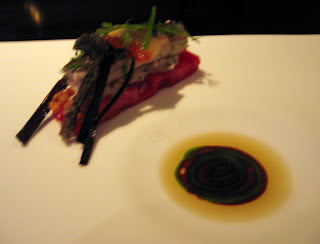 The combu (seaweed) was wonderfully complex in flavor. The yellow butter was a cow's milk butter churned on-site and topped with black salt. The white butter was goat's milk butter, something we'd never had before. It was subtle and gamey all at the same time. 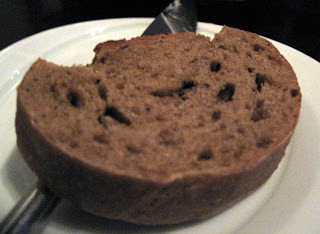 Different small breads were served intermittently throughout the meal and were more like a part of the meal, composed, than a side or an afterthought. This delightful dish was an homage to the tomato. 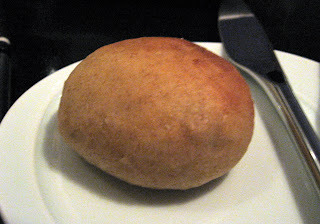 The dish was served on a "rosemary pillow": a pillow filled with rosemary scent upon which the dish was placed, slowly releasing the rosemary aroma as you ate. 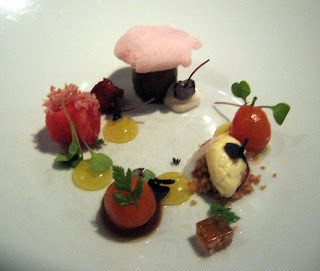 The dish was composed of cherry tomatoes, hazelnut pudding, frozen plum vinegarette, sherry vinegar balls, and a tangy cheese, among other things. 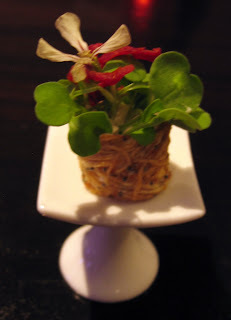 This playful finger food consisted of a crispy fried sardine surrounding a nicoise olive mousse and topped with microgreens. This was a wonderfully inventive use of a sardine and was a fun food to pop in your mouth. Earthy and very tasty with the goat's milk butter. This was Alexis' favorite dish of the night. 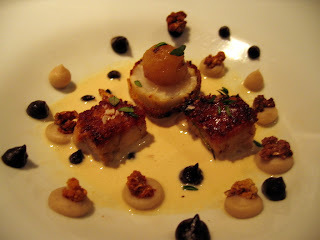 The sweetbreads were creamy and warm on the inside and super-crunchy on the outside. The sweetbreads were accompanied by carmelized, dehydrated cauliflower, which was full of flavor, chestnut puree, burnt bread puree and a toasted hay sauce. 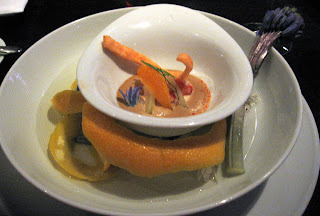 We didn't really taste the hay flavor, but this dish was just so amazing, on every level, from flavor to texture. 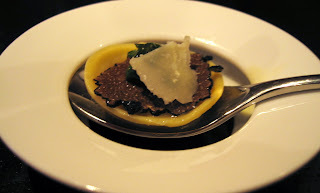 This single ravioli was filled with a black truffle broth that exploded in your mouth and topped with a slice of black truffle and a shaving of parmasan. This was similar to a Chinese soup dumpling in execution and the black truffle flavor was pure and intense. 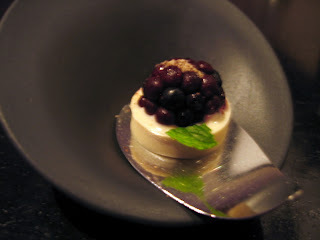 This tiny bite was a plump, ripe blackberry on top of a tabacco custard, with a tiny mint leaf. The tabacco aroma was sweet and intense, like a pack of unsmoked cigarettes, but the custard tasted just of subtle sweetness. 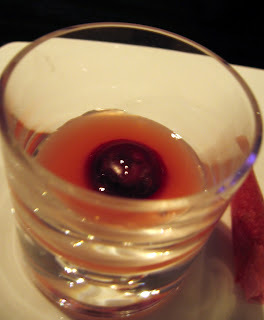 This was a shooter of rhubarb juice with warm beet ball. You are first hit with the tartness of the rhubarb and then a ball (gelatinous on the outside, liquid on the inside) of warm beet goodness explodes in your mouth. Delicious. Frozen huckleberry with lemon pudding. The flavor of this super-frozen, truly beautiful bite was not particularly innovative, but the texture was unlike anything we'd ever had. We popped the whole thing in our mouths in it went from rock-solid frozen to ooey-gooey in a matter of moments. 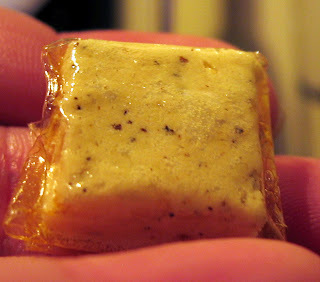 Freeze dried pineapple with bacon wrapped in a sheet of pineapple. 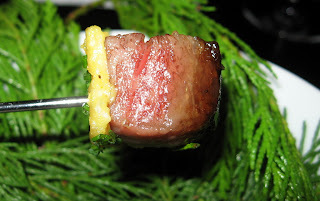 The sheet of pineapple stuck to our teeth, but this single, tiny bite was a highlight of the meal. It was warm and smoky and tart and sweet and just very, very good. This shooter was a cinnamon encrusted ball filled with apple cider, in a pool of walnut milk, finished with salt and vegetable ash. This tasted exactly as described and was very interesting. 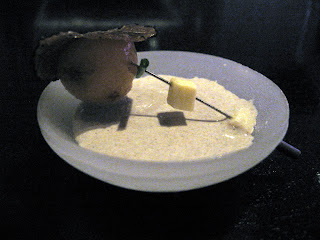 The roe was encased in a maple syrup packet and sat in a sweet corn and butter foam, studded with sweet corn. This dish was really wonderful. Who knew that sweet and fishy flavors could come together so brilliantly in a non-Asian dish? This dish was another complete sensory experience. 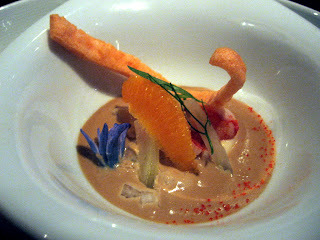 The outer bowl was filled with orange peel and hyacinth and hot water was poured into the bowl to release the orange and hyacinth aromas into the air while you are eating the delicious lobster pudding with parsnip puree and chunks of perfect butter-poached lobster. It was topped off with a lobster chip. The dish was playful, decadent and beautifully plated. This single bite was more like a palate cleanser than a course, and it wasn't our favorite. 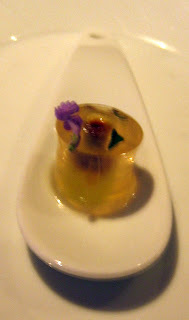 The flavors of honeydew, mint and sherry vinegar were interestingly paired with a jiggly, jello-like texture. This may just be the most photographed of all of Chef Achatz' dishes and it was beautiful, although much smaller than I expected. 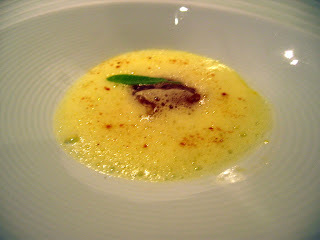 To eat, you pull the pin out of the side, releasing a tiny hot potato, a slice of black truffle, a single section of chive and a tiny cube of parmasan into the chilled potato and truffle soup. The you eat it like an oyster out of the half shell. Inventive and delicious. 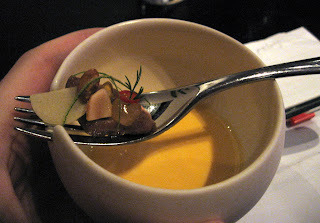 Heated cedar branches surround a single bite of perfect waygu with a yuzu pudding and a matsutake duxelles. We didn't really taste (or see) the duxelles, but this was the first time we've felt like we've had true waygu in it's fatty, delicious and melty grandeur. We learned that junsai is a member of the water lily family and it is strangely slimy and crunchy at the same time. 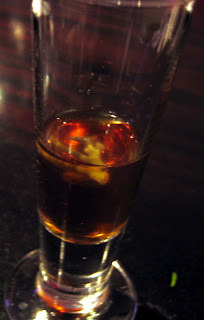 It was served in a very flavorful dashi shooter. 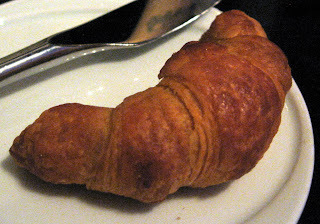 This was a bit too heavy to be a croissant, but it was hot and tasty. This very tender, beautifully plated roll of lamb tenderloin and lamb strip loin suffered a bit from being served lukewarm (we assume unintentionally). It was served with a variety of sauces for your own personal mix and match: lemon, saffron, pinenut, date, eggplant, yogurt, mint, dijon and pomegranate. 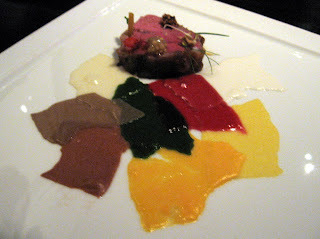 The lamb was topped with a variety of tiny condiments, like chili and mustard seed. This was a brilliant idea, but the lamb was served too cold and that sort of threw the dish off. This was transparency of raspberry with rose petals and a dusting of dehydrated yogurt. It was served in a rolling metal clip. The rose perfumed the dish and it was fun and inventive. As the sale of foie gras is banned in Chicago, this course was a "gift" from the chef, duly noted by our waiter. 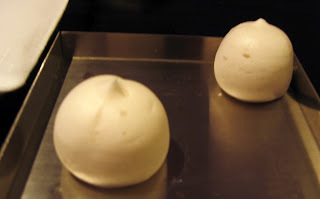 It was a crunchy cinnamon meringue surrounding foie gras and apple pate de fruit. Eaten in a single bite, the contrast of flavors and textures was amazing. This was the first of the dessert courses and it was quite complicated. In the center is a semifreddo of brie and avocado, topped with a lime ice. This was where our "off centerpiece" came into play as the lime juice was squeezed over the lime ice. The puddles are guava soda, which was a bit too sweet for us. In the top left corner is a sugar-shelled piece of brie and around the edge of the plate are crispy bits of pine nut and whole wheat. 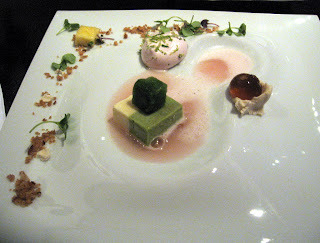 There is also a guava mousse and another exploding liquid ball, this time, I think it was guava, although there really were a lot of components in this dish. It was not one of our favorites, although the flavors came together better than I would have expected had we simply read a list of ingredients. 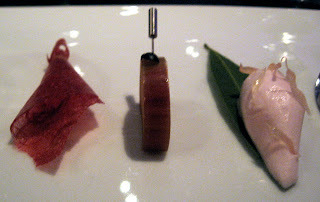 This playful dish was served on a bouncing needle, making it very difficult to photograph. 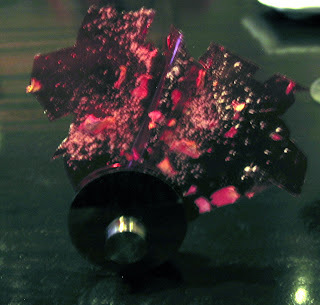 A piece of frozen licorice spice cake and orange confit were surrounded by spun sugar, creating a cotton candy effect. To eat it, you simply put your mouth around the entire bite. This was Alexis' least favorite dish, most likely because she is not fond of black licorice at all. This dish was odd and visually unappealing. It was composed of a spicy chocolate ganache, orange confit, soy marshmallows, rice pudding and lemongrass ice. The lemongrass ice was very good, but the rest of the dish was just hard to eat as it resembled, to us, something we'd rather not think about while eating. 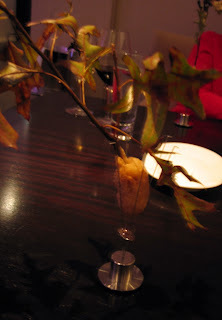 Frozen pumpkin pie puree was tempura battered, deep fried and dusted with a bit of cinnamon and sugar, then served on a branch with burning leaves. This was the best pumpkin pie ever and neither of us like pumpkin pie. The idea was interesting and it was executed perfectly. The only thing we would have changed would have been to omit the final sugar dusting, as we found it a bit too sweet. Chicago-Style Pizza in Chicago: Over-rated? 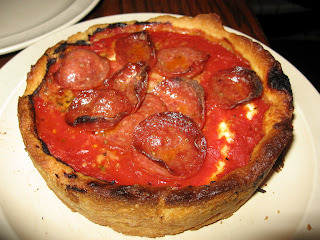 We knew when we were planning our crazy one-day Chicago trip that we had to sample the famous Chicago Deep Dish Pizza. Though we usually try to nose out the local hidden gems, rather than usual tourist traps, we decided that we had to make a homage to the where it all began, Pizzeria Uno. As expected, there was about a half an hour wait for a table (this was around 2pm). However, you put in your pizza order when you add your name to the list. Since they are made to order in about 45 minutes, the wait for the table ends up being a wash. Not knowing the process, when we were put on the spot, we confusedly blurted out, 'Pizza, uhhh, pepperoni, umm, individual.' If we had to do it all over again, we probably would have tried the Numero Uno with it's heaping helpings of toppings. We were seated inside in a corner by the waiter's station and ordered our much needed libations. (86 F and humid in October?) As we waited for the pizza to arrive, we surveyed the walls on which hung articles and awards detailing the history of this Chicago staple. We weren't fans of the crust at all, which was sort of crunchy and crumbly and teeth shatteringly hard. The sauce was excellent though--very bright clear in flavor. We ended up scraping out the toppings and eating them with a fork. As our second stop in our Chicago food tour, we headed over to Hot Doug's. Hot Doug's specializes in sausages, and despite toting themselves as an 'Encased Meat Emporium', it doesn't seem like you can buy sausages in bulk, just for eating. 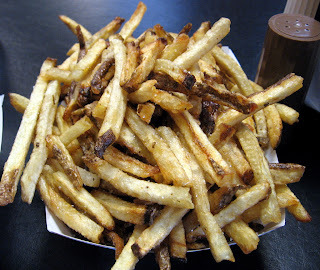 On weekends they also offer french fries fried in rendered duck fat. Service is of the queue up and order at the counter, and then wait at the table to wave down the cute waitress shouting your name out variety. Though they offer a wide variety of sausages, including enticing daily and weekly specials (like the Bacon and Chedder Elk Sausage), we were on a mission to taste the classic Chicago Style Dog. This was a huge basket of hand-cut, skinny fries from real potatoes. They less like potato and more like fat, which for us, was a good thing. We couldn't eat even half this basket, even though they were quite tasty, so we replated. 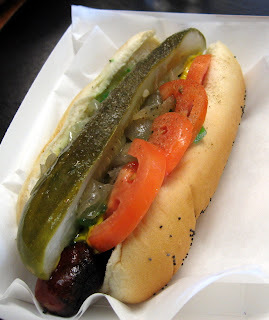 This is a classic Chicago style hot dog and it consists of a grilled (or steamed) hot dog, a soft bun (which we weren't too fond of), a dill pickle sphere, tomato slices, chopped onions, relish, mustard and celery salt. The toppings were good, but we think this could be improved on with a higher quality bun and a bigger, thicker sausage. We got a recommendation for Lula Cafe as a great spot for a Saturday Brunch. Located in the Logan Square area of Chicago, this spot was a bit hipstery but had al fresco seating (of which we could not partake because it was full when we got there). We were seated indoors right away and were presented with a brunch menu that did include a few items that looked interesting. The people seated around us seemed to be enjoying their surroundings and the food. We enjoyed the environment and the food was ok, but it was nothing to write home about, on the whole. A tasty, if standard, miso, packed with oddly shaped cuts of veggies which made it a tad difficult to eat. This sounded way better on the menu that it was in actuality. 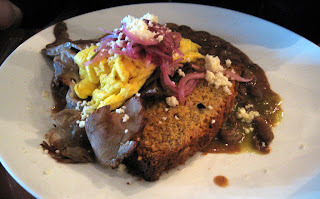 The eggs were light and fluffy and the pickled onions were good, but the pork itself was a tad dry, the cornbread was so sweet it was inedible and the beans were sort of hard. A bit expensive for a bagel. 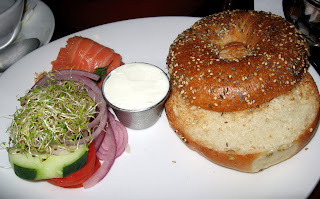 There was only enough cream cheese for 1/2 the bagel and the veggies were cut far too thick. 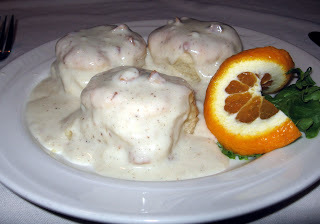 The biscuits were heavy and the gravy was not particularly flavorful. We weren't expecting all that much from the hotel connected to an airport hotel at 6:30 in the morning. 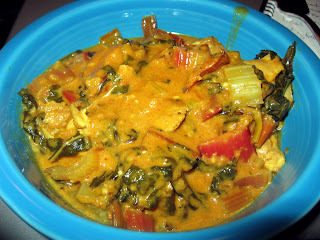 Alexis has been into cooking greens recently, and what better way to use hearty, multicolored chard, than in a creamy coconut curry. A one dish meal is perfect for weeknights and great for reheating the next day for lunch. chard and the coconut milk and cover. When chard is wilted, uncover and stir. Simmer until a thick sauce has formed. Season again with salt, if necessary. Giao was feeling very hungry after his workout today, so to his usual meatball order, he added a sausage egg and cheese. 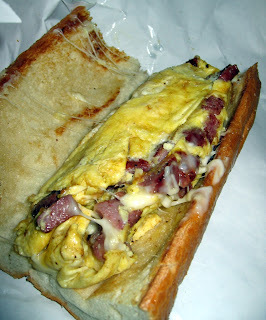 Giao fondly remembers his days of eating sausage, egg and cheese breakfast sandwiches from the food trucks in Philadelphia. To him, nothing ever seems to come close. In any case, this version was a bit dissappointing compared to the quality that he expects Gambino's. This is another super easy weeknight dish. I love this because you can take pre-cooked sausages directly out of the freezer, chop them up and throw them in the pan. No thawing necessary. I also use homemade pesto that I had previously frozen, so this dinner came together in a snap. Sautee the onions in a bit of butter until beginning to carmelize. 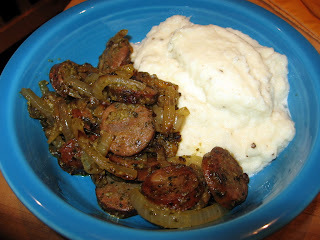 Toss in the sausage rounds and cook until heated through. Add the pesto. Stir to combine and cook for another 30 seconds or so. You don't want to cook the pesto too long or it will lose it's vibrant color. Boil the cauliflower in salted water until fork tender and drain. Add the cauliflower back to the pot with the rest of the ingredients (except cheese) and puree with an immersion blender until smooth. Stir in the cheese and season with salt and pepper. 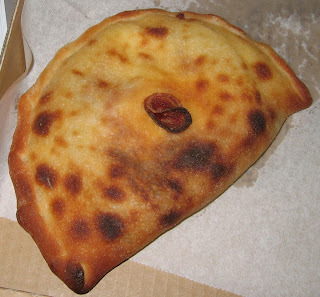 After Giao was dissappointed to find out they closed the Carl's Jr in the Embarcadero Center he headed to the little food alleyway alongside it and grabbed the last calzone from Parkway Pizza. The pizza is bad, but bad like most San Francisco pizza, so it's serviceable when you get that pizza urge, or find out the Carl's is closed. Health Code Violations unavailable (the site is down). 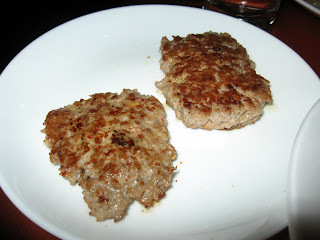 This easy weeknight meal is a nice play on the standard pan fried steak. 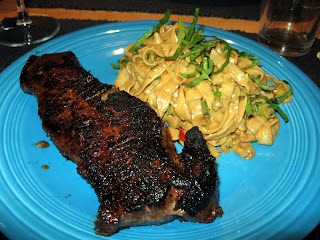 This steak is seasoned with sesame oil and Chinese 5 spice which matches well with the earthiness of the sesame noodles. Combine all ingredients except steak and mix thoroughly. Marinate the steaks in the mixture for at least 20 minutes. Then pan fry for about 2 minutes on each side (for medium rare) in a mixture of butter and olive oil over medium heat. Combine all ingredients except basil in a large bowl. Pour the sauce below over all of the ingredients and mix with your hands for a fork until the sauce coats the ingredients. It is easiest to do this when the noodles are warm. This dish can be served warm or at room temperature. Thoroughly combine the above ingredients until smooth.